Rise For Baby And Family | Services & support for infants & toddlers in New Hampshire's Monadnock Region. Donate now to support Rise for baby and family’s work with children and families throughout the Monadnock region! The board and staff at Rise for baby and family hope that you can join us for the 19th annual Taste of Summer! 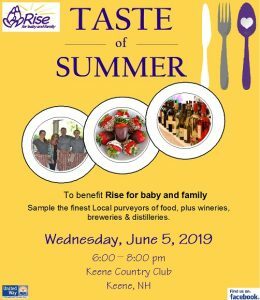 Wednesday, June 5 from 6:00 – 8:00 pm at the Keene Country Club. The Taste of Summer is our largest fundraising event for the year. Participants come to enjoy an evening of food and beverages from local restaurants, wineries, breweries, and distilleries. Additionally, participants can enter a raffle for a variety of gifts and prizes. The proceeds benefit Rise for baby and family’s work with children and families throughout the Monadnock region. 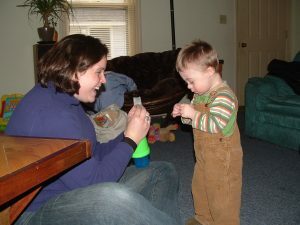 Rise for baby and family has been providing supports and services to infants and toddlers and their families in the Monadnock region since 1981. Rise serves over 250 children birth to three annually with early intervention and child care programs. When parents have concerns about their infant or toddler’s development, the impact of a premature birth, speech delay, suspected autism or any other concern large or small, Rise is available to help. We strive to develop a partnership with families; to combine the expertise of parents with that of professionals to create a team that will provide the best possible intervention. Rise serves over 250 infants and toddlers annually providing early supports and services and child care that includes children with special needs and their typically developing peers. We work closely with parents to build on their strengths in order to achieve the best possible outcome for their child. 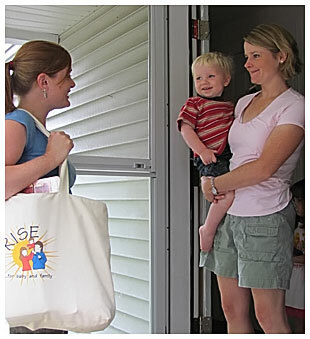 Rise has a highly qualified staff with extensive experience with infants and toddlers, birth to three years of age. We can help answer parents’ questions about their child’s development and provide supports and services that are tailored to meet the unique needs of the child and family. Highly qualified staff members include pediatric physical and occupational therapists and speech pathologists as well as early childhood specialists and social workers. There is no cost to families. 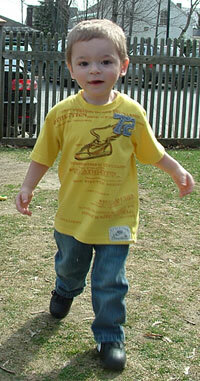 Rise provides high quality child care in a small group setting for children 4 months to three-and-a-half years. We include children with special needs with their typically developing peers in a warm and nurturing environment where all children are appreciated. Rise has been providing supports and services to infants and toddlers and their families in the Monadnock region since 1981. Rise provides high quality child care in a small group setting for children 6-weeks to four years. Rise has been proactive in accessing training and developing the expertise to respond appropriately to the needs of families with young children with autism. If you have any questions about our programs, or simply want to know how you can help us with our mission, please drop us a line!